Oscar winner Rachel Shenton has urged authors to feature more characters with disabilities in their stories. Shenton - who won an Academy Award for her film The Silent Child, about a deaf girl - was speaking on World Book Day. "I've learnt just how important it is for... children to see themselves in the programmes and movies they watch and in the books they read. "Never seeing themselves can be so demoralising, and makes their experiences seem invisible." 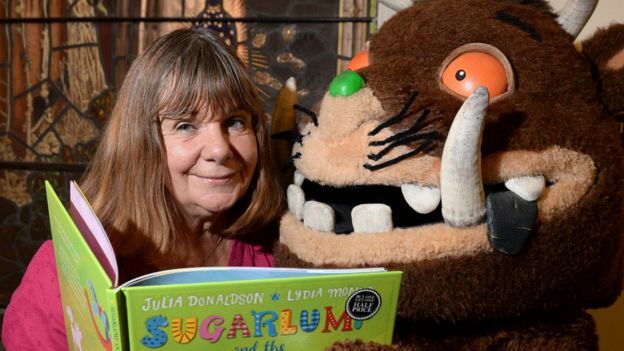 The Gruffalo author Julia Donaldson also called for more diversity in children's books. She said: "I've seen first-hand how powerful it is for a child to have their lives and their experiences reflected in what they read - to be able to say 'There's someone like me!" Astronaut Tim Peake, the Duchess of Cornwall, Strictly Come Dancing's Anton du Beke and authors such as Lauren Child and Jeff Kinney also publicised World Book Day, which sees schoolchildren dress up as their favourite book characters. Major Peake is encouraging children to visit their local bookshop with their £1 World Book Day token while the Duchess will visit a London primary school. Recent research found a fall in the number of children and young people who say they enjoy reading. World Book Day director Kirsten Grant said: "We know that a love of reading can transform a child's future, helping them to do well at school, get a good job and live a happy and successful life. "We are calling on parents and carers everywhere to put reading together at the heart of their World Book Day activities this year. Whether your children are dressed up today or not, sit down with them for 10 minutes on World Book Day, and every day - and share a story." She added: "Our ambition is to restore reading for pleasure as a celebrated national pastime for all."